Comparison chart templates include lots of special shapes, blank comparison, comparison table, product comparison, check box, progress, priority, 3-state priority, 3-state alert, 6-state status, 4-direction arrow, progress status, rating, quality, etc. All these shapes will be good assistants for you to make your diagram look more professional. 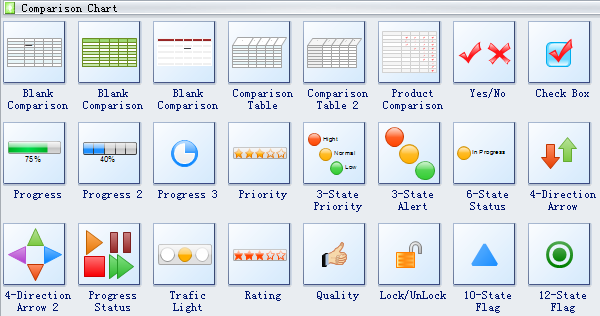 Comparison chart shapes like blank comparison, comparison table, product comparison, check box, progress, priority, 3-state priority, 3-state alert, 6-state status, 4-direction arrow, progress status, rating and quality are available. Comparison table is a table giving comparisons between leading financial or other products to demonstrate which are the best performers under certain criteria. Check box is a small area on a computer screen which, when selected by the user, shows that a particular feature has been enabled. Progress symbols indicate the current progress a project, a study, an experimnet or something else gets. Traffic light is a set of automatically operated coloured lights, typically red, amber, and green, for controlling traffic at road junctions, pedestrian crossings, and roundabouts. Rating is a classification or ranking of someone or something based on a comparative assessment of their quality, standard, or performance. Numbering is a listing order that is done with numbers, often used with a checklist or a set of steps that should be performed in order. Bar indicator is a bar that indicates the state or level of something. Need fresh looking comparison chart symbols for your design? These comparison chart symbols are a cinch to pop in. And their crisp, fine detail will make spectacular, easy-to-understand diagrams and presentations to your customers. These comparison chart symbols have some smart features that enable easy editing. Users can drag the green selection handles to resize shapes. Use the color bar or palette to change shape color. What is more, the floating action button allows 1 click change of style. No need to erase and redraw.